Can Cornelius make accommodations for vacation rentals? April 12. A well-known name in the world of luxury accommodations might have its eye on Cornelius and some of the swank abodes near the lake. Town Planning Director Wayne Herron said Four Seasons Hotels and Resorts, which offers “private retreats for rent around the world,” has approached the town about luxury vacation rental properties. The request for discussion came from attorney Elise Redmond who will talk with the Land Development Code Advisory Board June 24, Herron said. The problem: The current town Land Development Code does not allow “transient occupancy” in single-family residential dwelling units in the general residential or neighborhood residential zoning districts. It doesn’t matter whether the house is worth $5 million or $50,000. If Four Seasons, one of the finest names in luxury hospitality were to market the Cornelius homes of the rich and almost famous, the town’s residential codes would need to change. Imagine being able to rent a 10,000-square foot house with every amenity possible. But from the neighbors’ point of view, is the weekend visitor going to be Meryl Streep, or 20 college students on Spring Break? Four Seasons, based in Toronto, did not respond for comment. The hotel industry is feeling pressure from alternative stay businesses like Airbnb. Indeed, American consumers spent more last year with Airbnb than they did on Hilton and subsidiary brands such as DoubleTree and Embassy Suites, according to Second Measure, a company that analyzes debit and credit card purchases. Traditional hotel businesses have not rolled out the welcome mat for Airbnb. But interestingly enough, Airbnb itself is diving into the hotel space by acquiring HotelTonight, a provider of last-minute, boutique options for a night’s stay. Four Seasons is doing it on an entirely different level, with residences worthy of an overnight with Robin Leach. Vacation rentals have an interesting history in Cornelius. They were banned after neighbors complained about a vacation rental operation on Jetton Road near Brigadoon. The owner at the time, Steve Hambaugh, said he invested in the home for the purpose of renting it out for luxury- and party-minded guests. The issue then turned on quality of life for residents vs. property rights. The town board opted for quality of life, and short-term rentals of condominiums were never banned. 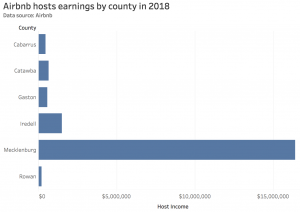 Airbnb hosts in Mecklenburg County, mostly in Charlotte, earned $16.4 million in 2018 from 141,000 guests, according to company figures. Statewide, Airbnb says Mecklenburg County is now second only to Asheville. Airbnb has also offered a number of condos lakeside, but has run into some HOA restrictions. Several of the larger developments in Cornelius have changed their bylaws in recent years, increasing the minimum rental period from 1-2 weeks to six months, effectively banning short term rentals. Phone: 704-895-1335 - PO Box 2062 Cornelius, NC 28031-2062.